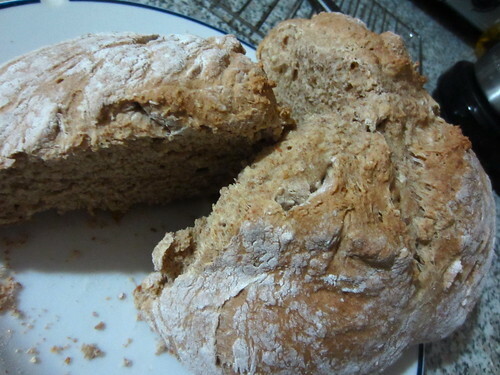 The entire Internet was full of Irish soda bread this week (well, and corned beef, but I ignored that), and I’d been wanting to make some, in my ever-continuing pursuit of bread that does not involve waiting 3 years to eat it. Though simultaneously I am planning to make a sourdough starter soon, which is the opposite. Anyway. There were a million recipes, and I chose this one because it wasn’t sweet and had some whole wheat flour. I took some butter out of the fridge to soften (I was very excited—usually I try to use butter straight from the freezer and it is disastrous) while I weighed my flours in my new scale. Storytime: When I got the scale a few days ago, the first thing I did was try to weigh Fitzpatrick. He bit me really hard when I picked him up, but I held on valiantly. Then I couldn’t get him to stay on the scale. So I don’t know how much he weighs. But the scale only goes up to twelve pounds, which he is probably more than. Then I weighed a grapefruit, and it was 263 grams. Then I weighed some generic Robitussin, and it was also 263 grams. I found this freaky and really funny, but I have told this to like six people already and no one else thought it was funny. Alas. Back to the baking. Flours, baking soda, salt. I squashed the butter into the flour with my fingers. (It never looked like breadcrumbs, as the recipe says, but I wasn’t aspiring for that because my cutting-butter-into-flour never goes like it’s supposed to. I am comfortable with this now and it seems OK.) Then I remembered I hadn’t made my buttermilk yet, so I did. Then I wrote a post about buttermilk. 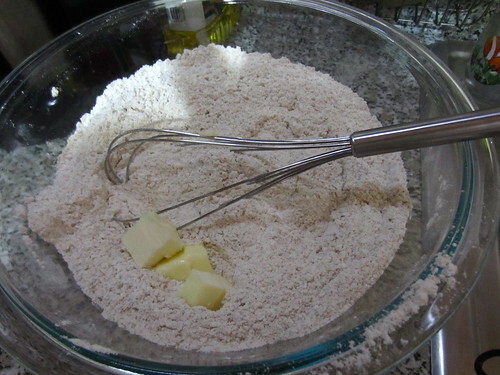 When it came time to pour the “buttermilk”/egg mixture into the flours, I started with about 2/3 of it, since that’s all the milk that would fit in the bowl with the beaten egg. I started mixing it in with my hand—this is where the recipe gets weird, you have to make your hand into a claw and use it to stir, which was really fun and mood-enhancing—and pretty soon it came together into a reasonable dough. I was like, oh, OK, I guess I didn’t need all that milk. (Cooking instinct.) Then I poured all the rest of the milk in. I have NO idea why. I think because I wanted to keep mixing/clawing, because it was so enjoyable. So at this point I had dough-milk soup, or like a bowl of cereal with one giant cereal that happened to be a ball of dough. 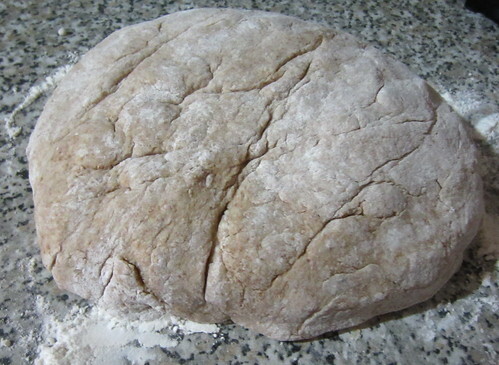 I kneaded valiantly, and soon all the dough was stuck to my fingers, with none left in the bowl. I managed—I honestly do not remember how—to get enough dough off my fingers so I could touch my bags of flour and pour more in. I repeated this many times, until I was able to touch the dough without immediately transforming into a monster with dough for hands. Then I put it on my floured countertop, made it into a ball, and slashed the top. So this is the thing. I’m always reading that you can’t really follow recipes for bread, you have to use instincts and like centuries of bread-knowledge that reside in your fingers. But I don’t have this because I’m Jewish, and know nothing about bread. Probably I would be killer at making matzah. (I feel sort of racist now. But I’m Jewish, so I can make Jewish jokes, right?) I have always avoided using my bread instincts because I assumed they would be wrong. So instead I’m going to say to you: ignore your instincts, but just add flour until you are physically able to touch the dough without all of it immediately coating your entire body. Brief update: This may have been bad advice. I don’t know. My bread is really dense. But it was physically impossible to handle before, so too bad. 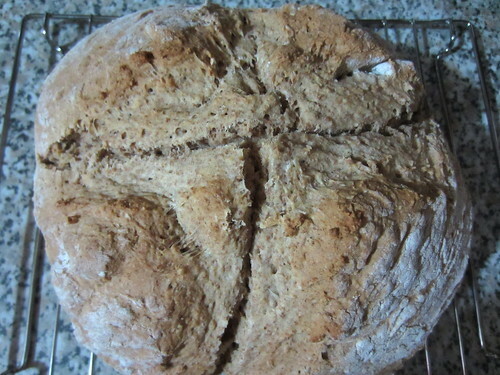 And I don’t know what Irish soda bread is really supposed to be like. This entry was posted in Dough. Bookmark the permalink. This looks good!!! But about the matzah, I at least don’t have Jewish matzah making instincts. did I ever tell you about the time we ran out during Passover and went to a bunch of different stores in Gainesville and no one had any so we made our own?? ?